The Wall Street Journal today provided more evidence that escalating gasoline prices are prompting more and more local governments to embrace smart-growth approaches to urban development. The focus of the Journal’s front-page story is Sacramento, California, where officials began looking for alternatives to sprawl as early as 2001 but met with resistance from developers stuck in the single-family subdivision mindset. Eventually, developers saw the light, and now builders are putting up apartments, condos and townhouses at a rapid pace while the portion of the market represented by single-family homes on large lots has been plunging. The change was fostered by the adoption of a growth-management plan covering six counties that emphasized keeping homes and jobs closer together. That plan, known as the Blueprint, is not mandatory for local governments in the region, but it has been widely embraced, according to the Journal, by “a strange-bedfellows coalition of ordinary citizens, politicians, developers and environmentalists.” As energy costs continue to rise, that support is growing. 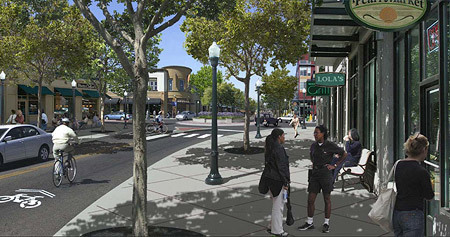 One developer told the Journal: “I see gas prices making people take the Blueprint seriously.” The accompany image shows how planners want more of the region’s streets to look. Smart-growth advocates have to walk a fine line. Just because high gas prices are prompting more people to become smitten with smart growth, that does not mean that expensive energy is a good thing. Time magazine makes this error in a feature entitled “10 Things You Can Like About $4 Gas” (No. 2 is “Sprawl Stalls”). Transforming the economy to become less dependent on fossil fuels is great thing—doing it in a way that enriches oil companies and speculators while driving down living standards for just about everyone else is not something to celebrate. This entry was posted on July 7, 2008 at 5:25 pm and is filed under Smart Growth. You can follow any responses to this entry through the RSS 2.0 feed. You can leave a response, or trackback from your own site.